For much of its existence, our backyard has been a playground for kids. 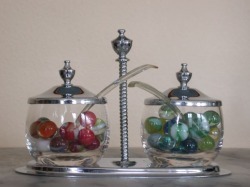 They left many marbles behind, inspiring the name "Marble Gardens." It is now a playground for us where our interests in art, food and low-impact living come together. Marbles found in the garden. 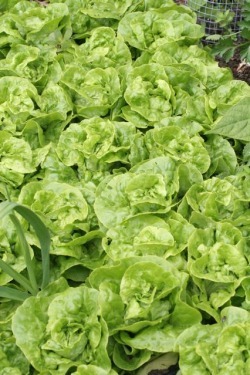 Growing vegetables and feeding ourselves from the garden has always been important for us. 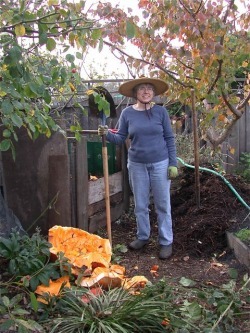 Anni’s mother was a serious gardener from a country background (chicken and pork came from the family’s farms and vegetables came from the garden), and Carol spent her summers off from college by working in an organic market garden. 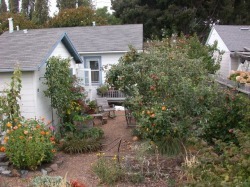 Furthermore, Anni was an apprentice for half a year at the French Intensive Farm project in Santa Cruz. 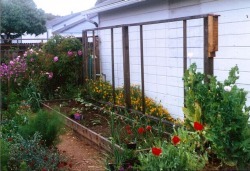 As we created the garden, we made space for raised vegetable beds. This year we removed a number of ornamental beds (Annie’s Annuals research beds) to make space for even more food growing areas. Sometimes we get more than we planned for. 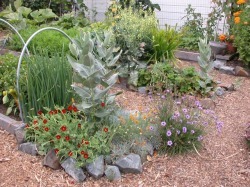 Endbeds with herbs and flowers. 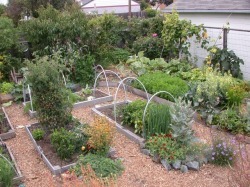 We have planted many fruit trees and continue grafting them to create more variety. 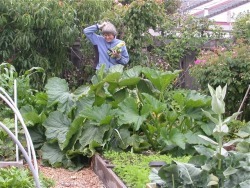 Soil fertility is important and Carol is the Compost Queen! 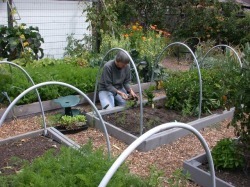 The garden is not just a homestead for us humans; much of the garden has been set aside as a habitat garden for wildlife. 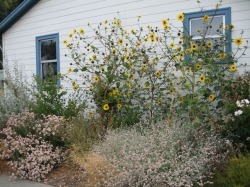 The street side gardens are planted with California native plants that thrive with rainwater only. 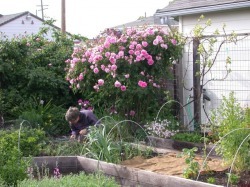 Some areas in the backyard are dedicated to plants for hummingbirds and pollinators. 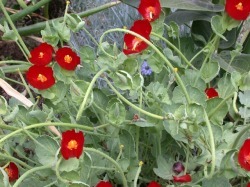 And yes, some plants are here just because we like them!